Just wanted to share a few projects with you all before turkey day arrives, and it just gets too hectic. 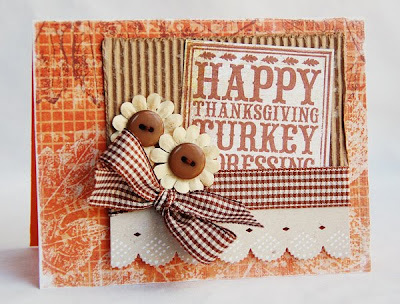 I made some Thanksgiving-themed projects using some new stamps by Purple Onion Designs. And I have to say that the noteblock stamp is my favorite. I can just see using this stamp for so many different types of projects. Well, that is it for me today. 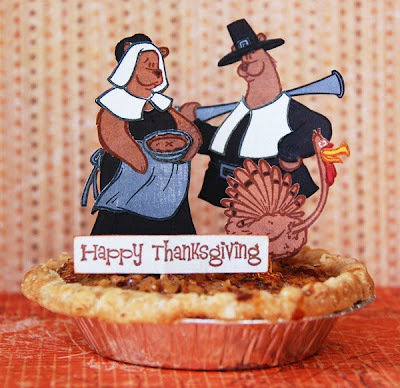 I hope you all have a happy and safe Thanksgiving holiday. Thanks so much for stopping by! Literally! With the holidays just around the corner, I decided to focus my blog project for Pink Paislee this month on Christmas gifting. If you are anything like me (and I am sure some of you are), you wait until the VERY last minute to get something together for the teacher, the bus driver, the mailman, etc. I am terrible about that. 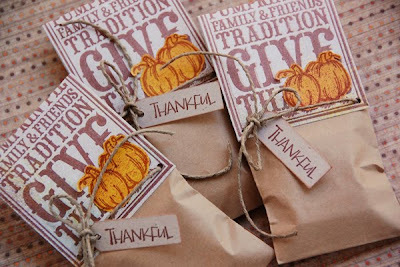 The bad thing is that when it is time to actually get something together, it is usually the night before and too late to go the store to buy a card or gift box/bag. So, I decided to show you how to get a little creative. 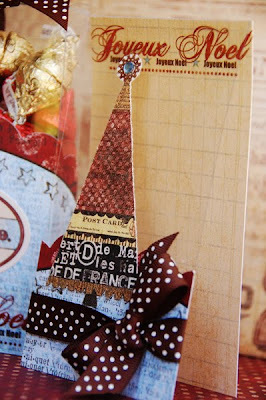 For the gift box, I used the clear container from one of my Winsome Chipboard packs. I just cut off the little hang tab, and decorated it with paper, a die-cut, and Borderlines clear sticker from the Mistletoe and Co. collection. I also added a little candy and ribbon, and it is all ready to go. Since I was going with a clear packaging, I decided to make a matching card. I used the clear cover from one of the Winsome sticker books for the card base. 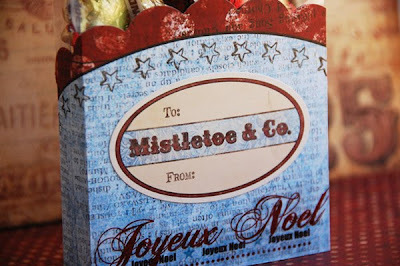 Added paper, a rub-on, and canvas patch from the Mistletoe and Co. collection also. I cut the tree from the canvas patch out to use on the front of the card. (I am planning on using the frame of the patch on a later project. ;) ) I then added some ribbon and a gem to finish off the card. 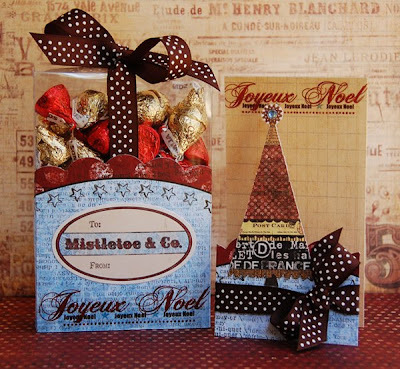 I hope you will keep this project in mind when you are looking to make up a quick little card and gift box for someone on your Christmas list. 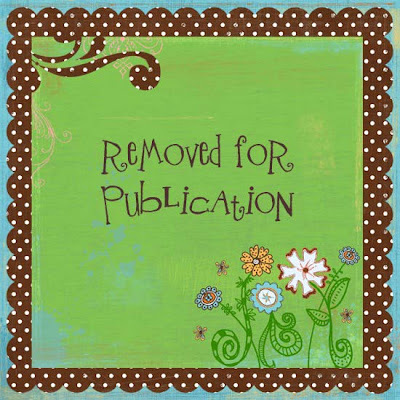 You really don't have to look any farther than your own scrapbook stash. I don't know about you , but I seem to have a lot of friends and family that have a birthday day this month, so it got me inspired to make a project with a birthday theme. For this tag, I got out my Shimmerz Spritz in Sea Foam and Olive Branch to make a background on a white tag. I spritzed the tag first with the Sea Foam. I didn't do even coats, because I wanted some areas to be darker than others. Then, I took the top off of the Olive Branch Spritz, dipped a brush in it, and splattered the spritz liberally leaving spots and drip marks. When it dried, I got a beautiful shimmery background to work with. Next, I painted the flowers with Shimmerz in Angel Wings to give them a bit of sparkle. Then, I added some patterned paper and embellishments, and voila! A handmade tag, perfect for adding to a gift for someone special. I hope this inspires you to get out your Shimmerz Spritz and try making a beautiful shimmery background for your next project.